Chesterfield manager Lee Richardson insists he will not be leaving to take over at former club Huddersfield. 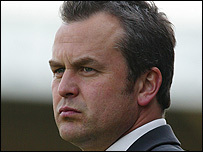 Richardson had been linked with the Galpharm Stadium hotseat, where the Terriers are without a manager after sacking Andy Ritchie. But Richardson told BBC Radio Sheffield: "All that interests me is promotion with Chesterfield. "Huddersfield Town is a great club and I enjoyed my time there, but at the moment I'm focused on Chesterfield." Richardson's coaching staff includes other former Huddersfield player Kevin Gray, which has no doubt fuelled the rumour mill. Chesterfield are currently eighth in League Two, one place and two points out the play-off zone with four games remaining.